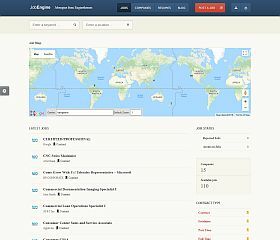 JobEngine delivers a simple and uncluttered layout allows your visitors and registered members to easily browse through listings, post their own availability, or on the opposite side – post their resume for others to see. Every detail and aspect has been given special attention and styling to deliver a theme that is not only powerful and highly functional, but beautiful and visually-pleasing as well. 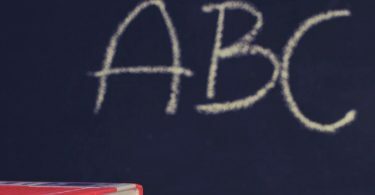 it’s a great way to set any type of job board website (or section). Specialty is a professional job board WordPress theme that allows you to easily set up a job posting/directory site. Manage everything from users and dashboards to employment postings, while having unlimited customization options that allow you to make it look and function how you want it to. 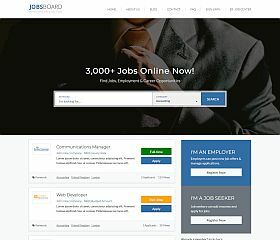 JobBoard was built specifically for those looking to build a career website or job listings/portal site. The listings are displayed prominently for your visitors to see and can be categorized by type of job and even multiple categories (like full-time and part-time help). Multi-functional in its application, this theme not only provides a clean and beautiful way to display jobs – and also functions to allow visitors to post their resumes as well – providing you with a complete, end-to-end solution. 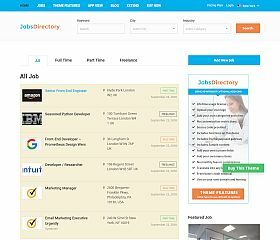 Jobs Directory is a premium WordPress theme that allows you to create a full-featured job board or job posting website. Easily categorize postings to you liking or needs (all jobs, full-time, part-time, etc. ), set up page for employers, provide all the information you might want with the detailed job posting pages, display the openings on a map, built-in payment handling (subscriptions, charges, etc. ), and a handful of other features that all make this a very powerful and feature-rich solution. 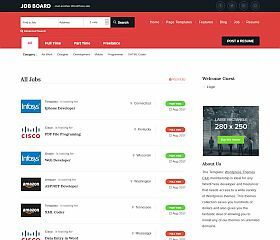 Jobs Board Theme is a powerful job board theme that allows you to easily transform your WordPress site into a fully-functional job board, complete with categorization of jobs, keyword search, and more. Customizable with a variety of color schemes, you can modify and alter the theme to suit your own needs and style – and is one of the more popular solutions available for job listing sites. 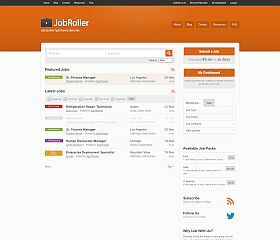 JobRoller is one of the original themes of its kind for WordPress, now powering thousands of sites and claimed to be the #1 job listings theme in the world. The theme comes with: a responsive layout and design, ability to syndicate listings (Indeed, SimplyHired, etc. ), AJAX and jQuery functionality, automatic image resizing, powerful administration back-end, custom job types, and works for both job seekers and employers. 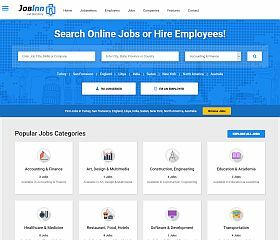 JobsFinder was built for those wanting to set up an online job portal. Features: parallax scrolling effects, background video capabilities, a featured content/image slider, social media widgets (for Facebook, Twitter, etc. ), responsive and built on Bootstrap, built-in contact forms, and other customization options that allow you to completely control the look and feel of your site. 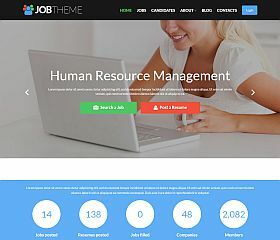 JobTheme is a beautiful and powerful job directory/listings site, this theme for WordPress provides all of the features and functionality you could want. Optimized for performance, this responsive theme features lazy-loading images (which optimizes load time), custom pages (for 404 pages, testimonials, blog, etc), optimized for SEO, custom widgets, Google services integration, and many other features are all built into the package. Opening is a very clean and professional-looking theme that is powered by the premium Job Board Pro WordPress plugin (which is included with this theme). It provides a crisp and fresh design that is sure to capture the attention of your visitors. 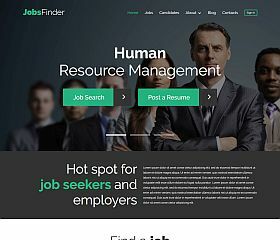 JobFinder is a responsive and Retina-ready theme for posting job openings that features custom functions and features, including: WooComerce support and integration, premium plugins included, instant Ajax search, advanced search filtering by keyword and location/geography, and more. 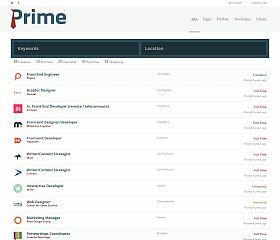 Prime is about as simple of a solution for creating a jobs site that you will find. With an ultra minimal layout, responsive design, and parallax effects – it provides a simple and easy-to-use solution that can be up and running quickly. 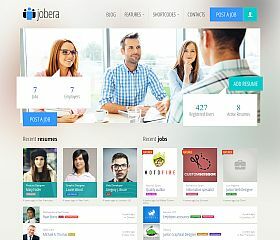 Jobera is a WordPress theme that offers unmatched aesthetic quality with a look that will distinguish you from the other sites that offer job listings or posting. With unique animation effects, responsive layout and design, and a beautiful and appealing design – you will find that this theme delivers on all fronts. 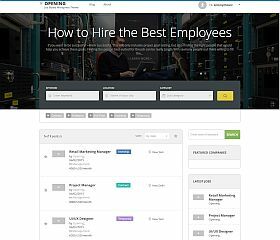 Jobify is a theme for WordPress that delivers a modern-looking solution that should meet the needs of anyone who is trying to set up a new job board site (or make an additional section for an existing site). The responsive layout, flat-style design, and other extras and features – make this a popular choice amongst those looking for a great all-around theme for WordPress. 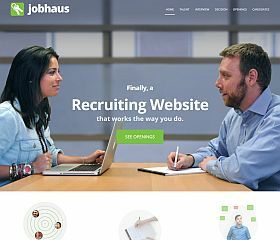 JobHaus was built to meet the needs of job recruiters, hiring managers, or any type of job seeking website. With a very bold and striking design that is sure to catch the attention of your visitors – it offers a unique look that helps you stand out from other sites. Nine to Five is a carefully-crafted, responsive, premium theme for WordPress that excels at providing one of the most simple and clean designs of its kind. 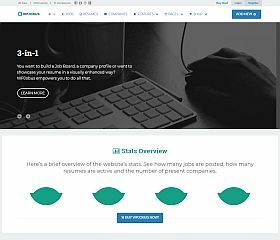 Built exclusively to power a jobs site, it provides everything you might need to post employment listings while offering a simple installation and setup process. 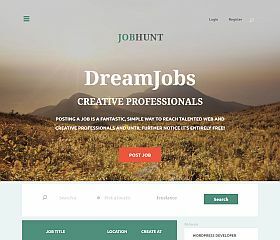 JobHunt is a modern and eye-catching, bold design that makes the theme stand apart from some of its competition with its emphasis on perfectly-placed pixels. 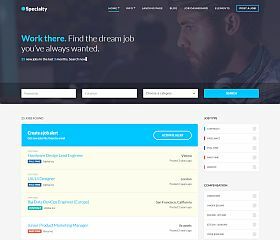 From the Retina-ready and responsive layout to the built-in features, it offers everything you need to create a great-looking jobs site. 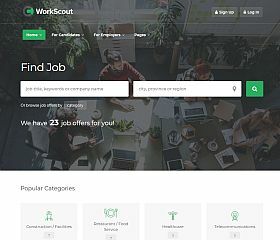 WorkScout was built with all of the features and functionality you might need to create a professional website for posting jobs, it gives you all of the things you need to manage every aspect of an employment site. From eCommerce integration with WooCommerce to the powerful bookmarking and and filtering features – this is a truly professional theme to power your job portal. 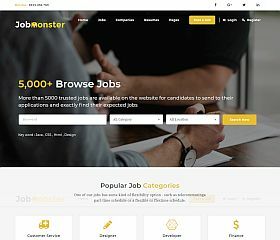 Jobmonster allows you to create an amazing-looking (and functioning) job board with this responsive, premium theme without the use of plugins, you can have a truly professional and first-class site or section for job postings. With powerful administration tools, employers and applicants can manage every aspect of the hiring process – from individualized dashboards to custom functions, this theme has it all. Jobseek utilizes the free WP Job Manager WordPress plugin, this theme extends the features and functionality to provide you with a full-featured solution to create the ultimate job and employment platform. Integrated with WooCommerce, it even allows you to collect payment and make money from postings. 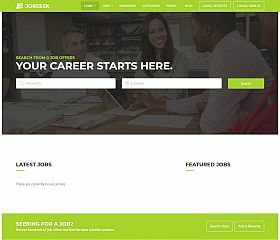 Whether you’re looking for an employment or HR solution for managing applicants, or you’re wanting to set up a dedicated site – JobSeek is a WordPress theme that provides everything you might need. 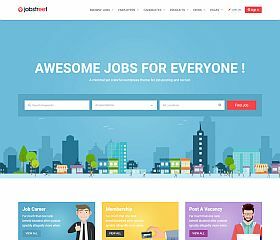 JobCareer is one of the most powerful job board/portal solutions available for WordPress, it’s a theme that offers unmatched design and functionality for your job listings. 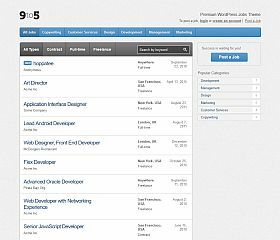 JobCareer provides you with all of the necessary tools and components that you would typically only find in paid plugins. Integrated with WooCommerce, Indeed, geolocation features, and dozens of other extras – it gives you a complete solution for creating a simple employment website or section of an existing site. 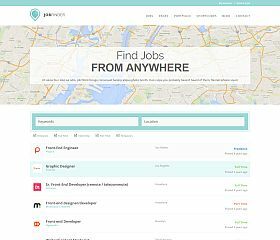 JobInn lets you create your very own directory for jobs and employment listings with this super flexible theme for WordPress. From location and region filtering to the customization options (like headers, layouts, sections, etc. ), you can modify everything to your exact specifications. Perhaps the best theme available for creating a job directory site, you can be up and running in no time. 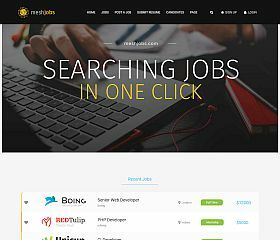 MeshJobs is one of the most beautifully-designed job board themes, providing you with an ultra-modern look and layout that is sure to capture the attention of your visitors. With carefully-placed sections, it conveys a sleek style that is surely one of the most impressive available anywhere. Included in the theme you will find advanced search and filter functionality, resume search and management, employer and applicant management – the features and options are too numerous to count. 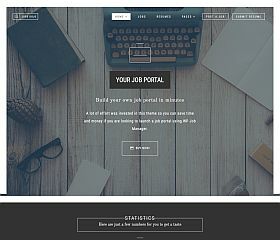 WPJobus is a multi-functional theme for employment sites, it gives you all of the tools necessary to create a rich and engaging job portal/listings/board directory. With three main content sections built into the theme, it gives you full control over the look, feel, and functionality of your site – giving you the power to customize it to fit whatever needs you might have. JobsDojo has you covered from start to finish when you’re wanting to set up job postsings/listings on a site or section of your existing site. Visitors can submit and upload their resumes, while employers and businesses can also submit their job offers – it’s a pre-built two-sided marketplace that was designed for interaction and efficiency. 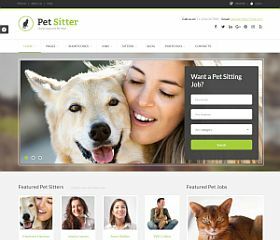 Pet Sitter is a WordPress theme that gives you the ultimate job portal/board/directory website if you’re in the pet or service industry. Set up with the package that’s included are multiple page/layout options, powerful search and filtering, applicant/service candidate profiles, custom administration touches, and one of the only custom-built pet-related themes of its kind available anywhere. 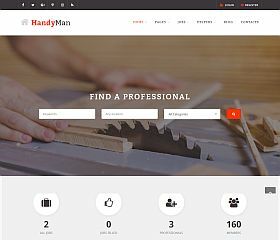 Handyman was built to function as a job listing/directory site for those offering services. Whether you do landscaping or handyman work, or you’re a professional or skilled laborer (like a plumber, electrician, or specialist) – this theme provides the ultimate service-finding solution. With similarities to Angie’s List, this theme includes a number of powerful features including Resume Manager and WP Job Manager. JobPress is an ultra modern job board/portal that is responsive and built upon Bootstrap – ensuring your site looks great on any device. Extensive customization and theme options allow you to modify the theme to suit your needs – everything from colors and fonts can be changed in minutes to give you a look and design that you and your visitors will love. At one time, there were only a handful of sites where you might go to when searching for a job or posting for an opening. Sites like Monster, Craigslist, and Indeed made up the bulk of the traffic on both sides – and practically dominated the online employment marketplace. However, as time has gone on and the industry has become a little less consolidated – more opportunities have opened up for those wishing to take a little slice of the traffic. While new players like LinkedIn and others have emerged as the dominant force, there is still plenty of room for other players in the field. Many have found success taking the niche route and creating sites that cater to specific industries or demographics, while others have internalized their employment practices by creating either mini-sites or sections within their existing websites to gain new talent. What once might take months of development in coding, designing, and building out a jobs site – can now be done in a matter of minutes with the right set-up. WordPress (along with several independent designers and developers) has given anyone the ability to set up their own jobs site (portal, directory, board, or listings section) – with just a remarkably small investment of time and money. There are now a handful of truly world-class job-related WordPress themes that will give you all of the features and functionality you might need – whether you’re setting up a new site or creating a section on an existing one.